allowing the belt to turn several corners over a considerable length using only one drive. High impact plastic slats attached to side flexing chain are removable without tools. Salts overlap for maximum sanitation and safety, preventing jam-ups and keeping cutlery from falling in between slats. 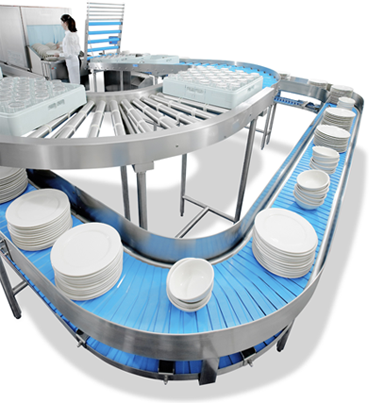 High-density polywear strips ensure only plastic to plastic contact for low friction and wear. 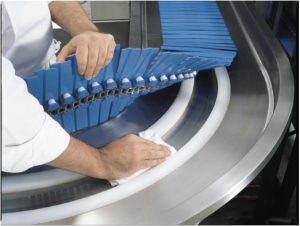 Tapered rollers on the underside of each slat ensures only rolling friction at all corners, while allowing the belt to be lifted out of the conveyor bed at the corners for cleaning. 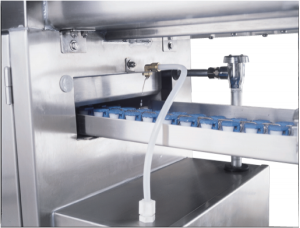 The drive cabinet has a standard built in belt wash. A wash tank contains stainless steel embossed sparay arms located above and below the belt to thoroughly spray the belt with water. 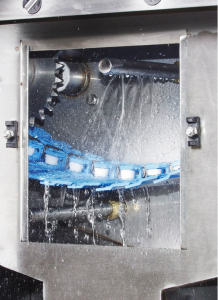 A detergent drip system adds detergent automatically on timed basis, keeping the belt clean at all times.